Quality in the entire process | Backer-Elektro a.s. Most attention is attached with quality assurance in the whole process of production of electrical heating elements at Backer Elektro CZ in all parameters. For the entire production, the best quality materials supplied by world renowned manufacturers are used, this being one of basic conditions for achieving highest quality of the final products. Long term wide experience and know how in development and construction as well as an advanced production technology supported by consistent control of all required parameters ensure the highest quality of heating elements in connection with their reliability and long life time corresponding to its application area. Backer Elektro CZ states its engagement in permanent guard of highest quality of its products as well as in increasing the quality level of all customer services. 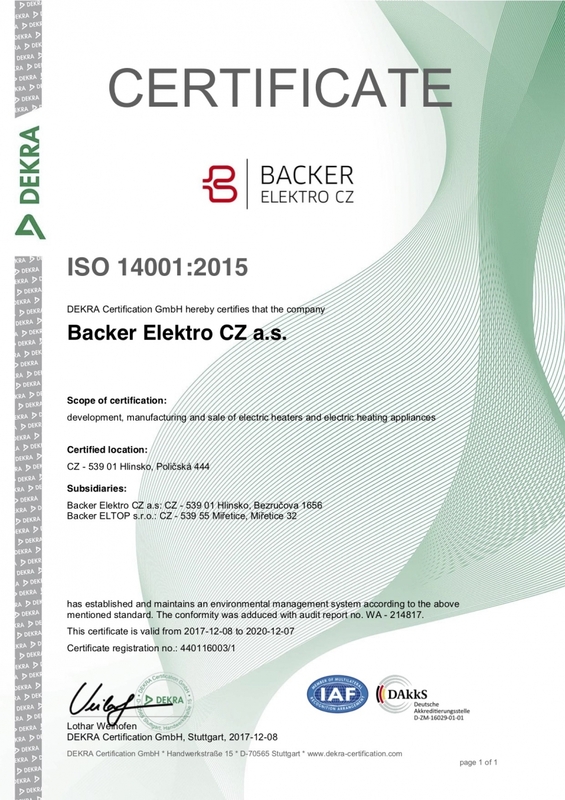 Clearly defined policy and objectives of quality control of Backer Elektro CZ and its application in all steps of company management guarantee our goals. The quality management system at Backer Elektro CZ is certified with ISO 9001:2015 Certificate issued by DEKRA Certification GmbH. The achieved quality level is regularly audited according to corresponding standards. Under the responsible approach towards environment and sustainable development there is also established system of environmental management ISO 14001:2015.